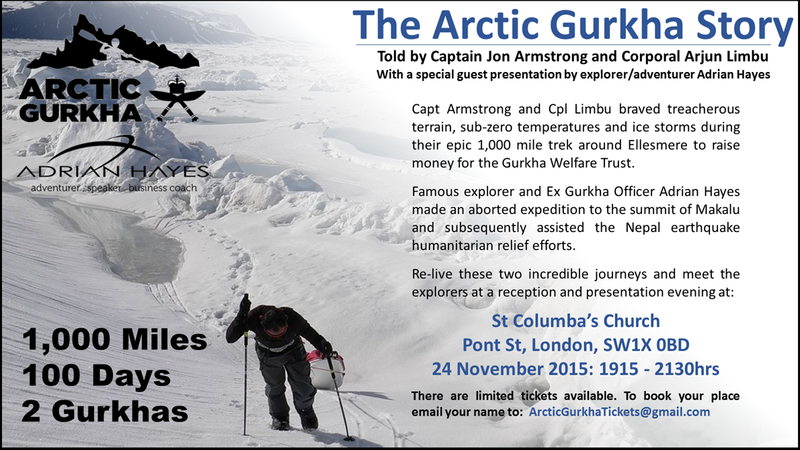 Captain Jon Armstrong and Corporal Arjun Limbu will be presenting the story of their 1,000 mile-100 day expedition to Ellesmere Island to an Audience at the St Columba’s Church in Pont Street, London, on 24 November this year. The fearless pair braved treacherous terrain, sub-zero temperatures, lethal crevasses and blinding ice storms during their epic voyage, and up to 300 people will be able to hear their story and see some of the fantastic sights they found along the way. They will be joined by guest presenter Adrian Hayes, a renowned explorer and adventurer who will talk about an attempt to summit Makalu before the Nepal Quake hit and his subsequent efforts to assist the relief operations. Tickets are free available on a first-come first-served basis by emailing ArcticGurkhaTickets@gmail.com for your chance to meet the three explorers and hear their stories, and there will be a collection on the evening with proceeds going to the Gurkha Welfare Trust Earthquake Appeal.